Yann Chave is not a domaine with a long history in Hermitage. It was created quite recently as it was founded in 1970 by Nicole and Bernard Chave after they made their first vineyard purchase of 4 hectares of vines, close to the village of Mercurol. At the time, only 1 hectare was planted with vines. The remainder of the land was being used for fruit trees. By 1972, they saved enough money to begin planting vines on their other 3 hectares of vineyard land. And no, Yann Chave is not related to the famous JL Chave. At first, they sold their grapes to negociants and the Tain l’Hermitage cooperative. In 1983, they broke ground and slowly began building their own winery and cellars. The first vintage for Yann Chave where they produced, bottled and sold their own wine was made from the 1996 vintage. 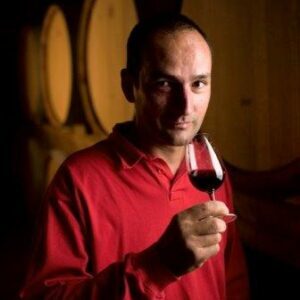 The domaine was named after the son of Bernard Chave, Yann Chave. From that point forward, they continued adding vines to their holdings and today, they own 17 hectares of vines in the Northern Rhone. The vines are dispersed into two appellations. They have 15.5 hectares in Crozes Hermitage and 1.5 hectares of vines in the Hermitage appellation. They also maintain lease agreements with other growers in the region so they now make wine from 20 hectares of vines in total. In 2003, they finish construction on a brand new, modernized cellar. Yann Chave is now entirely owned and managed by Yann Chave who took over from his father Bernard Chave. In Hermitage, their vines are located next to Le Meal on the hill of Hermitage. The vineyards are on a steep hillside with a terroir of granite soils. On average, their vines are 30 years of age. Their vines in Crozes Hermitage come from Mercurol, La Roche de Glun and Pont de l’Isere. All farming is done using only organic vineyard management techniques. Yann Chave produces 3 red wines and 1 white wine. However, Yann Chave only produces 1 red wine in Hermitage. The remaining wines come from his vines in Crozes Hermitage. Yann Chave Hermitage comes from vines planted in the lieux-dits of Beaumes and Peleat. 80% of the vines are planted in Beaumes, which is next to Le Meal. The vines are still young, but they are aging, as they are on average 30 years of age. Yann Chave Hermitage is vinified in stainless steel vats. The Hermitage wine of Yann Chave is then aged in neutral 600 liter barrels for an average of 17 months before bottling. The average annual production is close to 550 cases per year. Yann Chave produces 3 wines from vines they own in Crozes Hermitage. The red wine of Yann Chave from Crozes Hermitage is produced in much of the same method as they use in Hermitage, but with less aging and vatting time. The white wine of Yann Chave is usually a blend of 70% Marsanne and 30% Roussanne and is aged in neutral tanks. Yann Chave, when young, should be decanted at least 1-2 hours, give or take, allowing the wines to soften and open their perfume. Older vintages might need very little decanting, just enough to remove the sediment. Yann Chave is usually better with 7-9 years of cellaring and should be at its best between 10-20 years of age. Yann Chave is best served at 15.5 degrees Celsius, 60 degrees Fahrenheit. The cool, almost cellar temperature gives the wine more freshness and lift. Yann Chave is best served with all types of classic meat dishes, veal, pork, beef, lamb, duck, game, roast chicken, roasted, braised and grilled dishes. Yann Chave is also good with Asian dishes, hearty fish courses like tuna, mushrooms and pasta. The white wine of Yann Chave is best served with a myriad of different seafood dishes, shellfish, crab, lobster, sushi, sashimi, chicken, pork and veal, as well as Asian cuisine. Still bearing the deep color from its youth, the wine is loaded with ripe, sweet, peppery, dark red berries, earth and chalky, rocks and stones. There is a solid depth of flavor and plenty of bright, red, spicy fruits in the finish. Another 5 years of cellaring should be perfect for this wine. Medium. full bodied, with a yellow and orange, buttery, citrus character, oily textures and a fruit and stone finish. The wine was made from a blend of 70% Marsanne and 30% Roussanne. Young, inky, dark and brooding, with a few hours of air, the wine started to really open up. The wine is concentrated, rich and long. The licorice, cracked pepper, rock, earth and ripe, fresh blackberries are there from start to finish in the nose and on the palate. Another 5 -10 years will add a lot of complexity to this wine. Still holding on tight, yet, there is no doubt as to how this is going to grow up. With good concentration, depth of flavor, and plenty of ripe tannin coupled with a showcase of smoked meat, thyme, blackberry, dark cherry and crushed rocks, the wine will need another 7-10 years before it starts showing its best. Young, deeply colored, vibrant, tannic, full bodied and demanding time, with effort, peppery, fresh dark berries, earth and spices come to the forefront.